I seriously can't believe that it's been 30 weeks already! 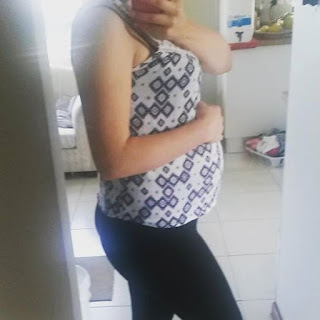 Since my last update, nothing much has changed except that my belly is starting to feel stretched. As baby has been growing I feel like all the loose skin that I had (having been a slightly chubby teen) was just filling out and there hasn't actually been any skin stretching. I do also, however, have my very first pregnancy stretch mark. It's only about 1/2 cm in total and super thin but the weird thing is that it is a vertical one just right to my belly button. I had always been under the impression that they radiate around your belly with the belly being all round and stuff. On another note, I feel that I should let everyone know that I'm currently trying to decide between pocket diapers and cover with separate inners. Jacques and myself decided even before getting pregnant that we want to use cloth diapers for many reasons like the environment, baby skin health and the economic strain disposables cause. Since the two options both have a great deal of pros to each side I'm finding myself completely indecisive.